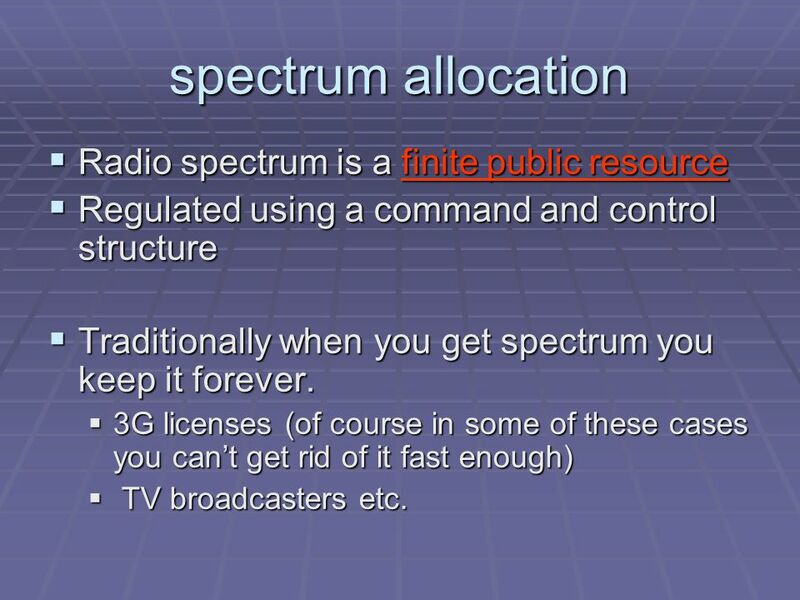 2 spectrum allocation  Radio spectrum is a finite public resource  Regulated using a command and control structure  Traditionally when you get spectrum you keep it forever. 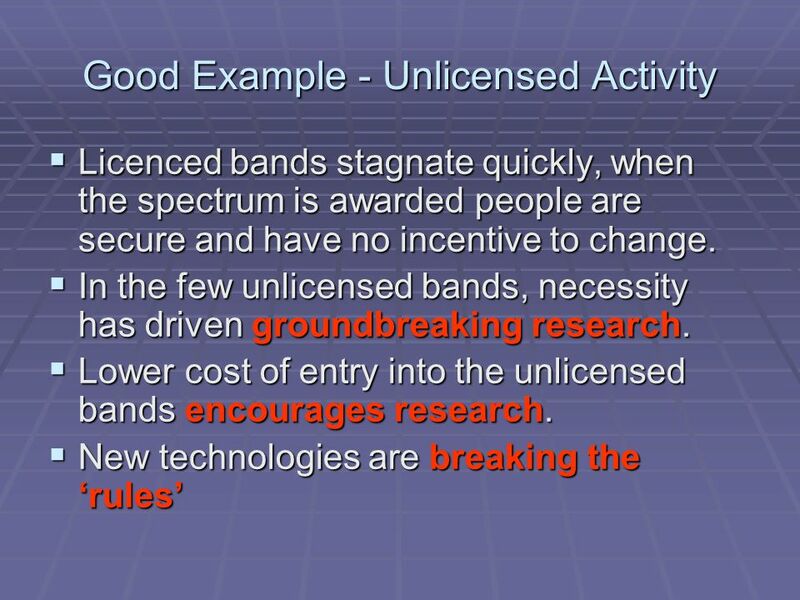  3G licenses (of course in some of these cases you can’t get rid of it fast enough)  TV broadcasters etc. 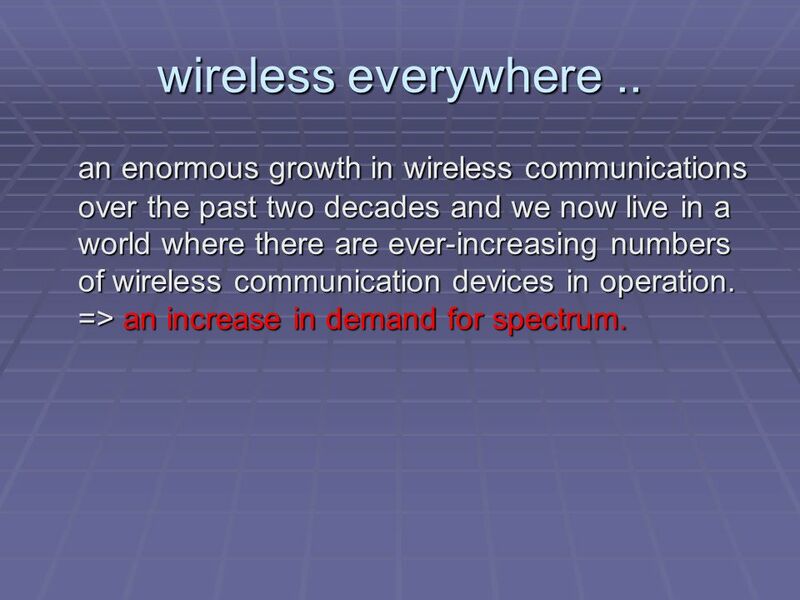 3 wireless everywhere.. an enormous growth in wireless communications over the past two decades and we now live in a world where there are ever-increasing numbers of wireless communication devices in operation. 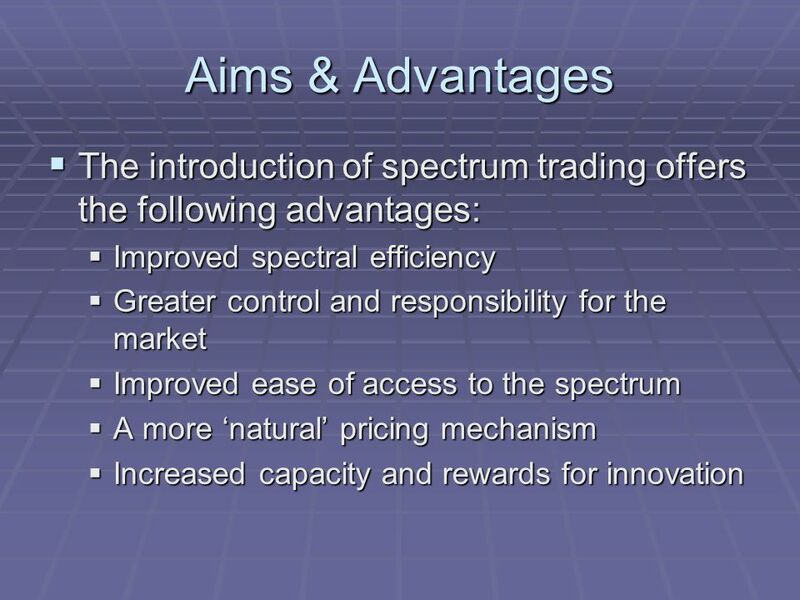 => an increase in demand for spectrum. 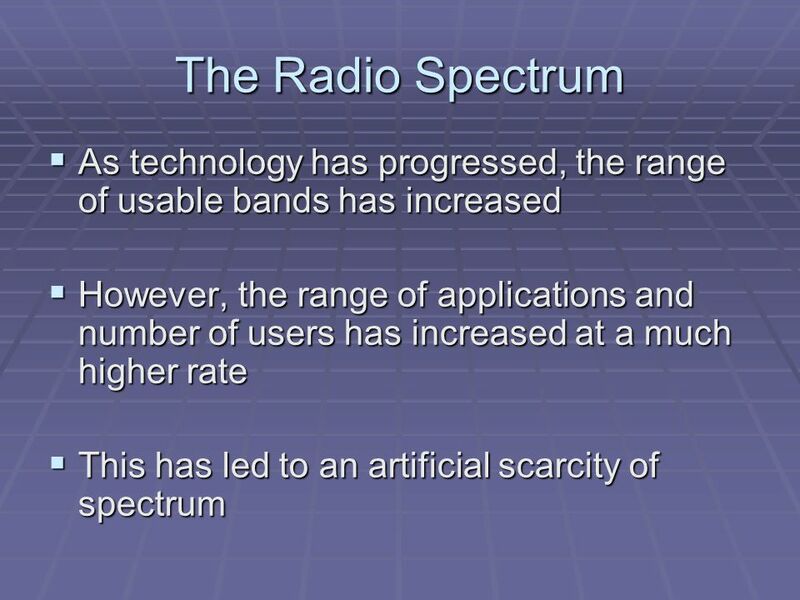 7 The Radio Spectrum  The main driving force behind research into spectrum management is the alleviation of the man made spectrum scarcity. 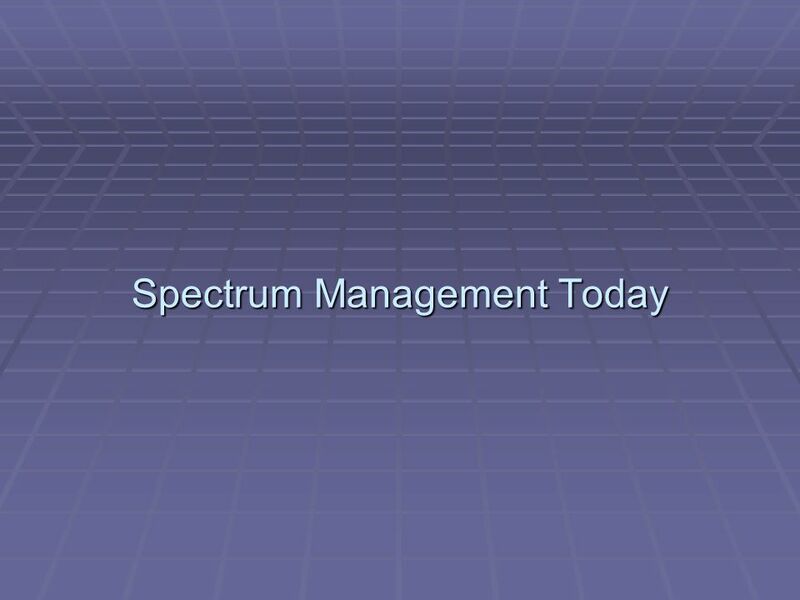  Most of the spectrum has been allocated.  Even in the licensed bands that are busy, the level of activity often varies wildly with time and location. 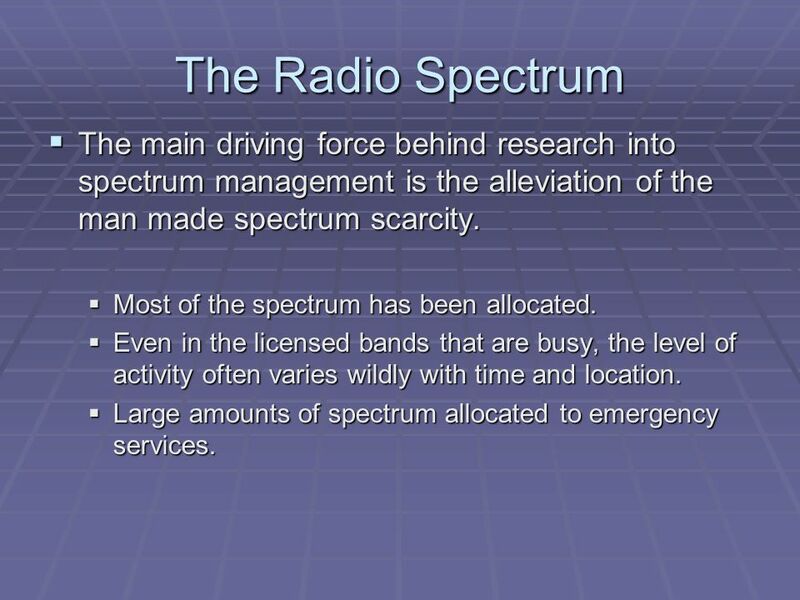  Large amounts of spectrum allocated to emergency services. 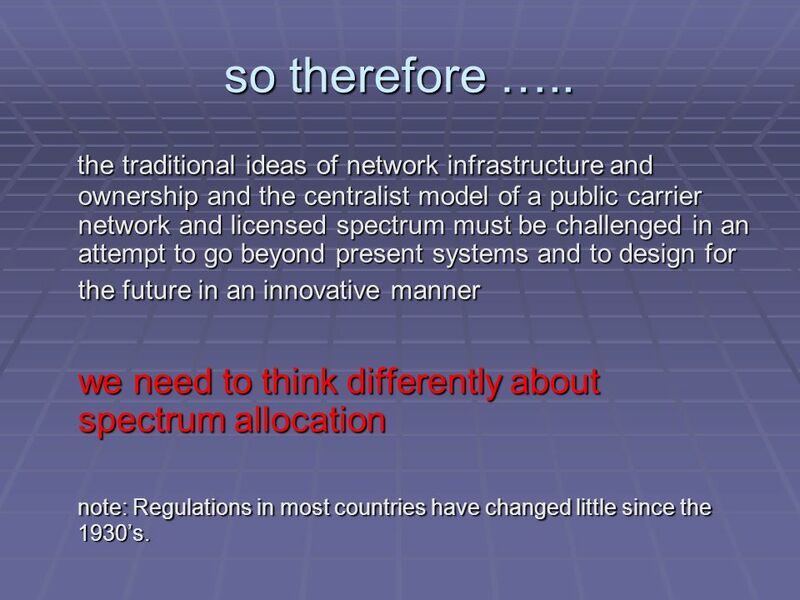 10 so therefore ….. the traditional ideas of network infrastructure and ownership and the centralist model of a public carrier network and licensed spectrum must be challenged in an attempt to go beyond present systems and to design for the future in an innovative manner the traditional ideas of network infrastructure and ownership and the centralist model of a public carrier network and licensed spectrum must be challenged in an attempt to go beyond present systems and to design for the future in an innovative manner we need to think differently about spectrum allocation note: Regulations in most countries have changed little since the 1930’s. 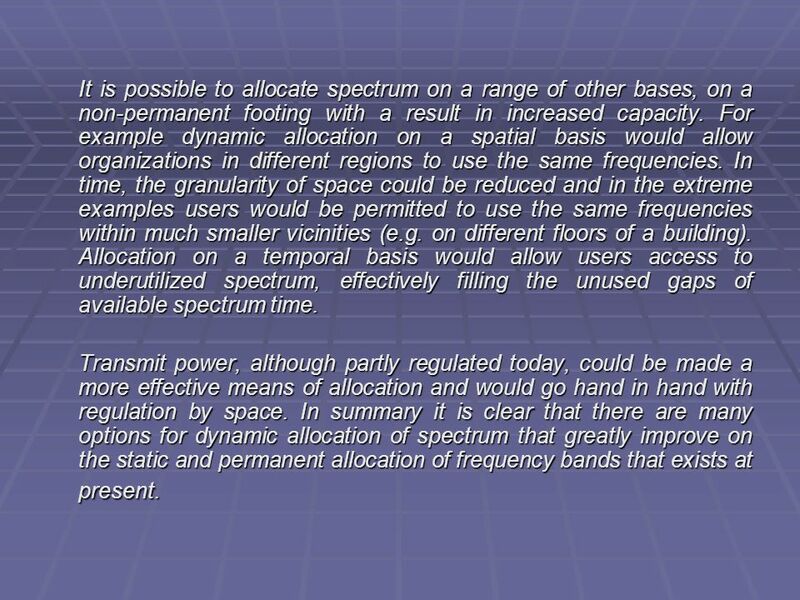 11 It is possible to allocate spectrum on a range of other bases, on a non-permanent footing with a result in increased capacity. For example dynamic allocation on a spatial basis would allow organizations in different regions to use the same frequencies. 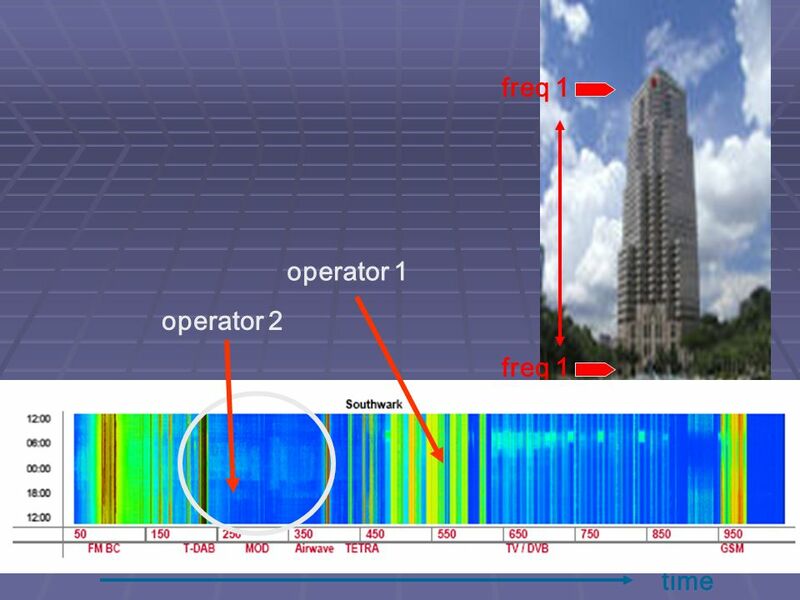 In time, the granularity of space could be reduced and in the extreme examples users would be permitted to use the same frequencies within much smaller vicinities (e.g. on different floors of a building). 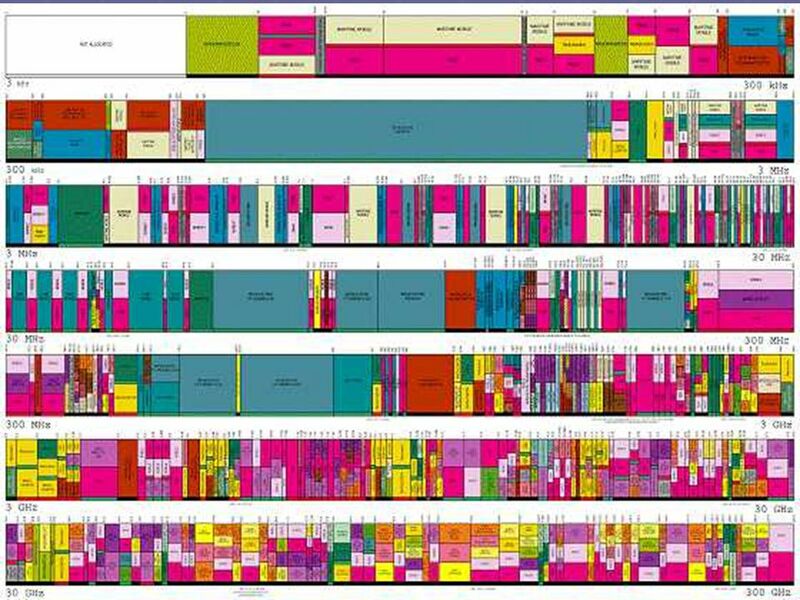 Allocation on a temporal basis would allow users access to underutilized spectrum, effectively filling the unused gaps of available spectrum time. Transmit power, although partly regulated today, could be made a more effective means of allocation and would go hand in hand with regulation by space. 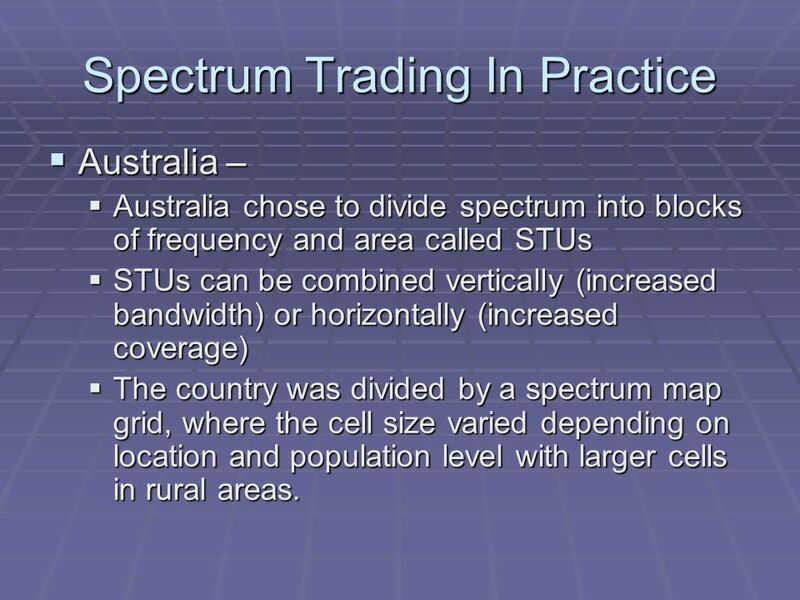 In summary it is clear that there are many options for dynamic allocation of spectrum that greatly improve on the static and permanent allocation of frequency bands that exists at present. 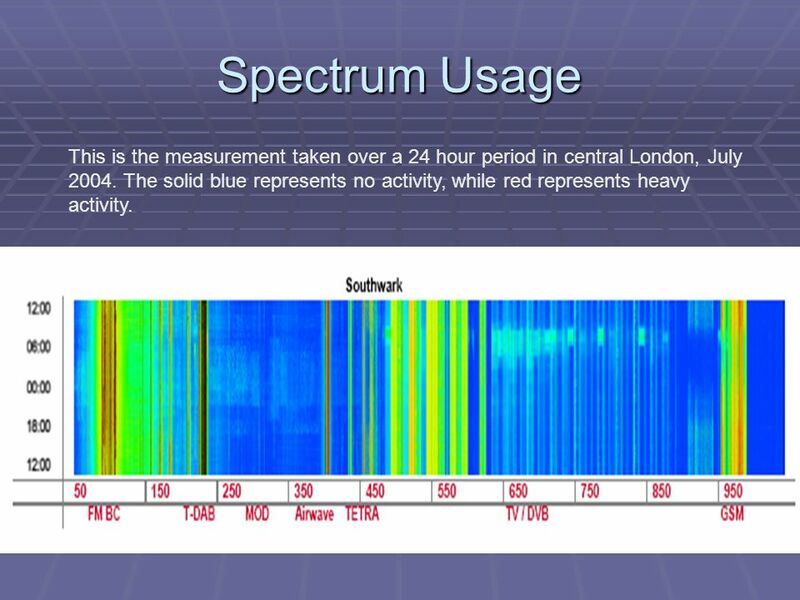 12 Spectrum Usage This is the measurement taken over a 24 hour period in central London, July 2004. The solid blue represents no activity, while red represents heavy activity. 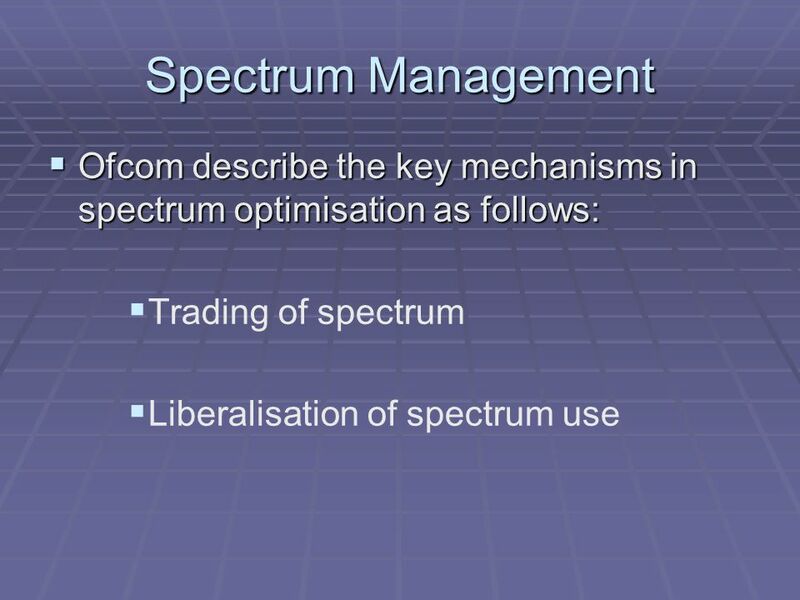 16 Spectrum Management  The Ofcom Spectrum Vision 1. 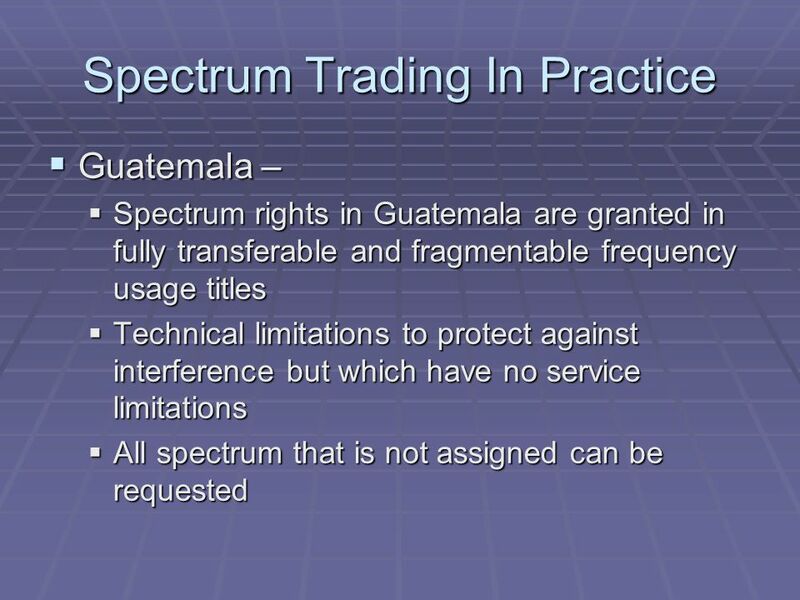 Spectrum should be free of technology and usage constraints as far as possible. 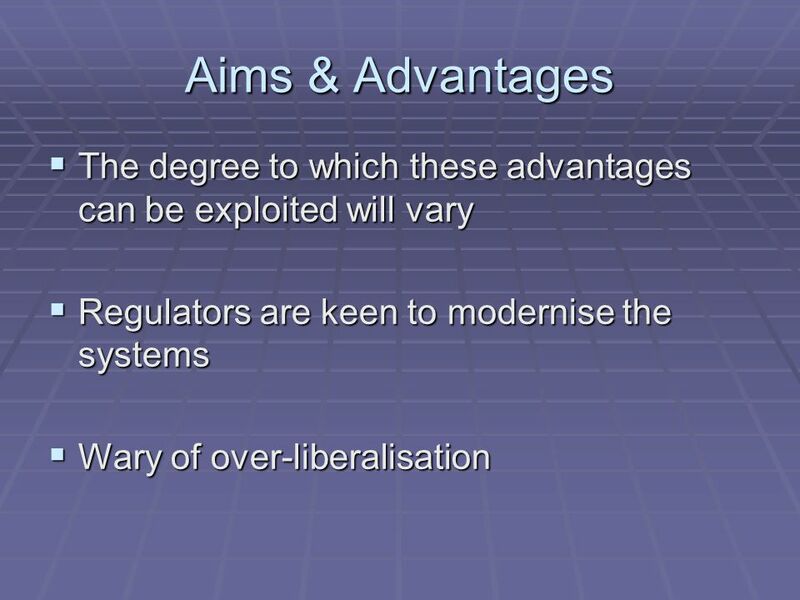 Policy constraints should only be used where they can be justified; 2. 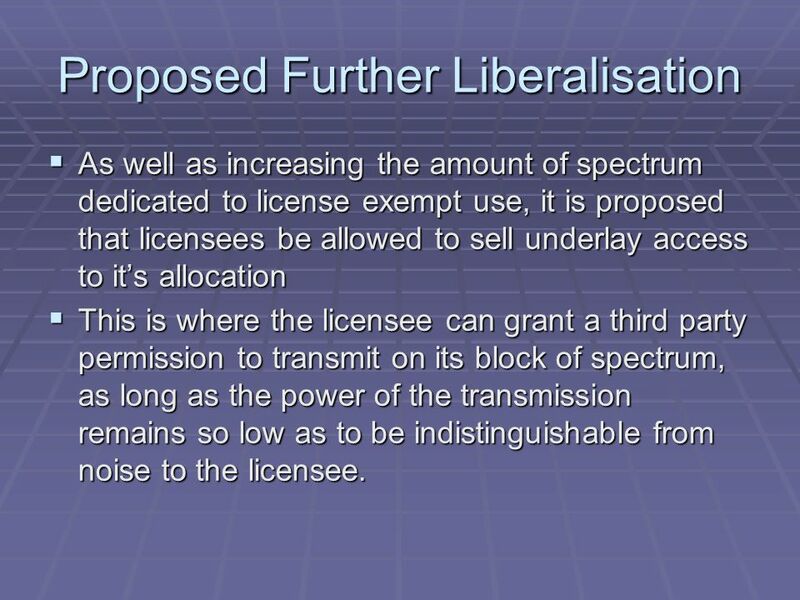 It should be simple and transparent for licence holders to change the ownership and use of spectrum; and 3. 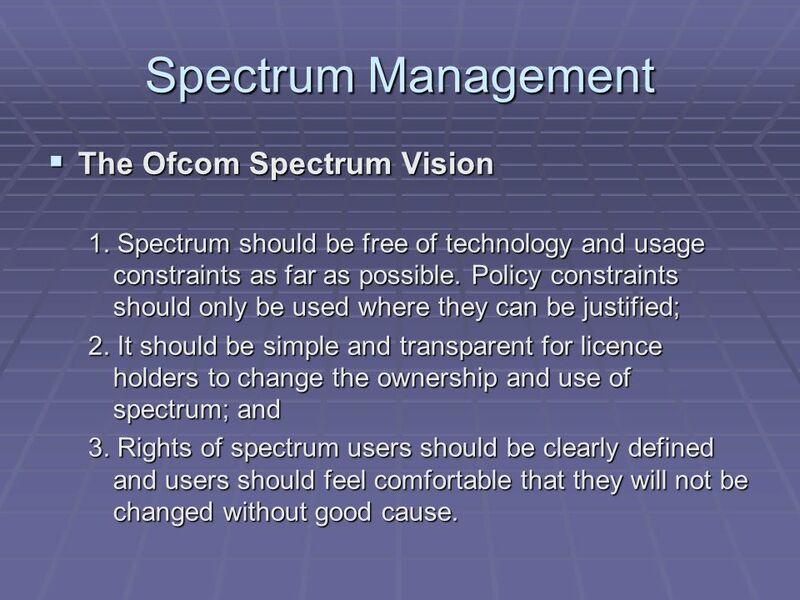 Rights of spectrum users should be clearly defined and users should feel comfortable that they will not be changed without good cause. 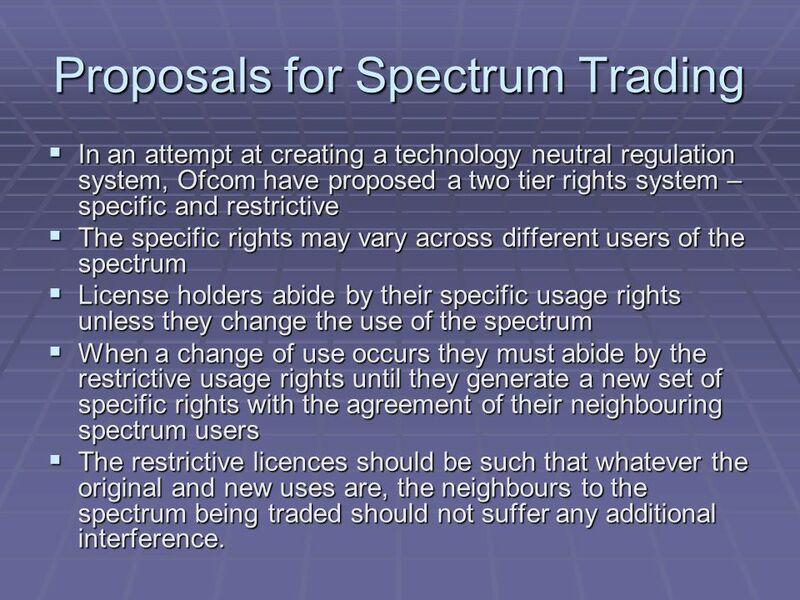 21 Proposals for Spectrum Trading  In an attempt at creating a technology neutral regulation system, Ofcom have proposed a two tier rights system – specific and restrictive  The specific rights may vary across different users of the spectrum  License holders abide by their specific usage rights unless they change the use of the spectrum  When a change of use occurs they must abide by the restrictive usage rights until they generate a new set of specific rights with the agreement of their neighbouring spectrum users  The restrictive licences should be such that whatever the original and new uses are, the neighbours to the spectrum being traded should not suffer any additional interference. 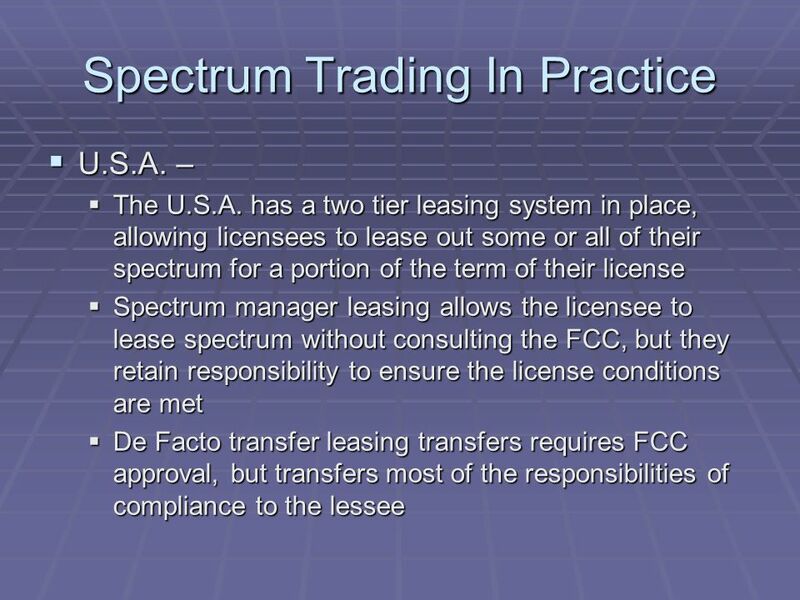 22 Worked Example   Broadcaster A indicates to a 3G operator that they would be willing to trade part of their spectrum. 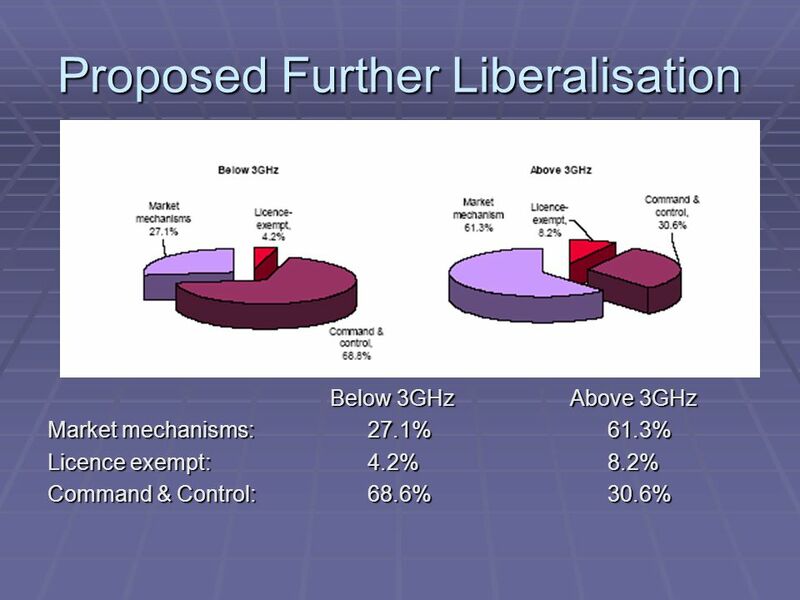 Were this to happen, the 3G operator would only be able to use the restrictive spectrum usage rights. 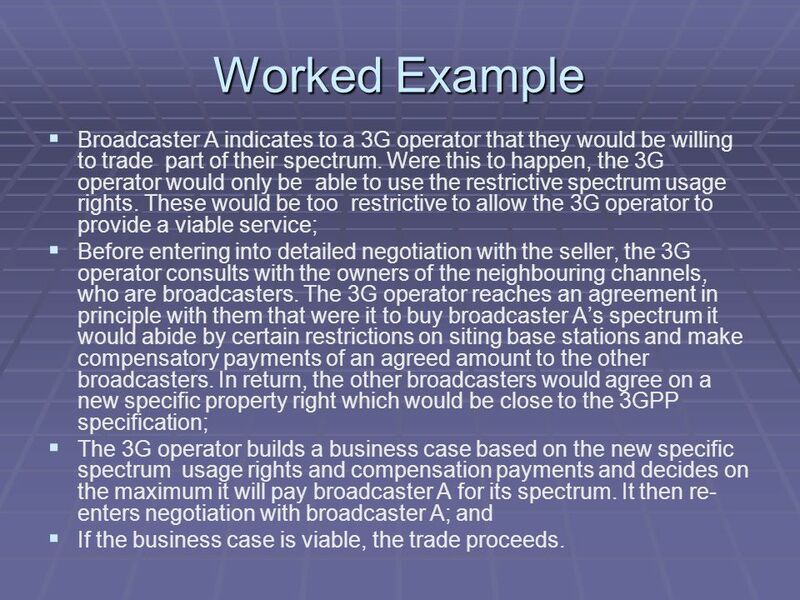 These would be too restrictive to allow the 3G operator to provide a viable service;   Before entering into detailed negotiation with the seller, the 3G operator consults with the owners of the neighbouring channels, who are broadcasters. The 3G operator reaches an agreement in principle with them that were it to buy broadcaster A’s spectrum it would abide by certain restrictions on siting base stations and make compensatory payments of an agreed amount to the other broadcasters. 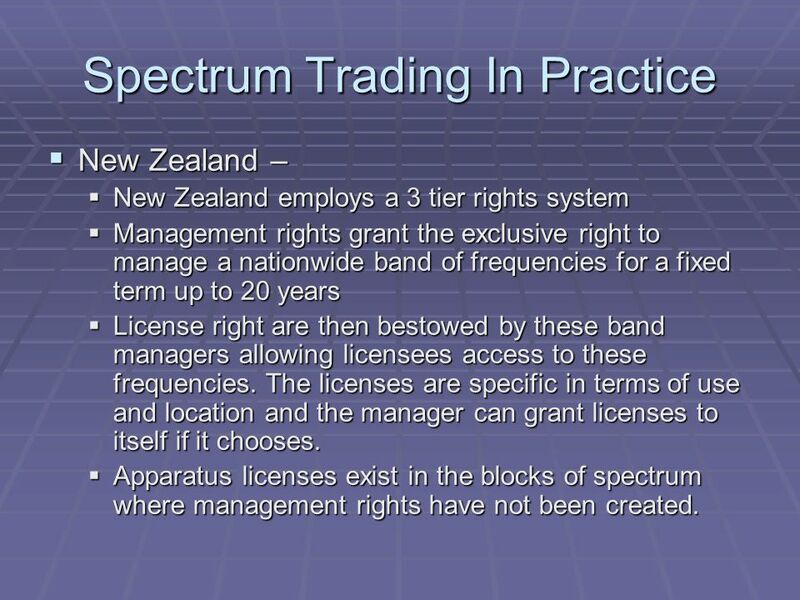 In return, the other broadcasters would agree on a new specific property right which would be close to the 3GPP specification;   The 3G operator builds a business case based on the new specific spectrum usage rights and compensation payments and decides on the maximum it will pay broadcaster A for its spectrum. It then re- enters negotiation with broadcaster A; and   If the business case is viable, the trade proceeds. 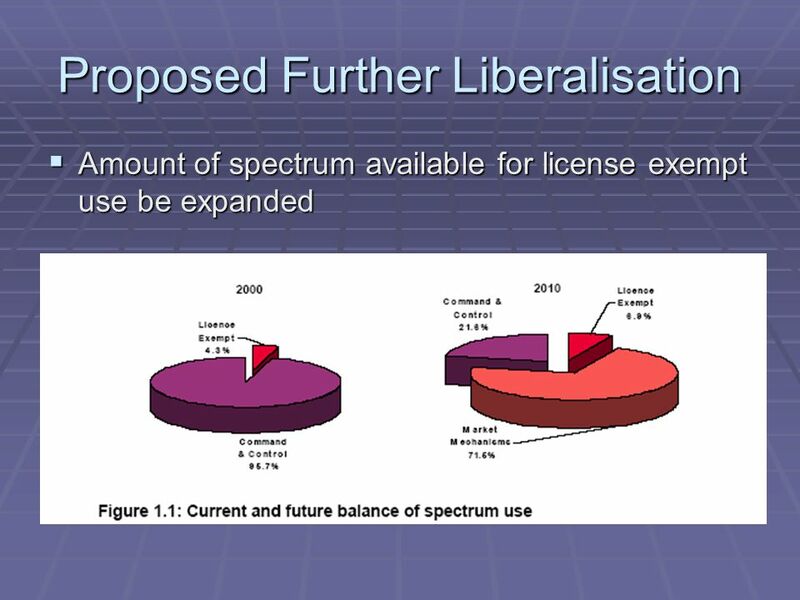 26 Proposed Further Liberalisation  As well as increasing the amount of spectrum dedicated to license exempt use, it is proposed that licensees be allowed to sell underlay access to it’s allocation  This is where the licensee can grant a third party permission to transmit on its block of spectrum, as long as the power of the transmission remains so low as to be indistinguishable from noise to the licensee. 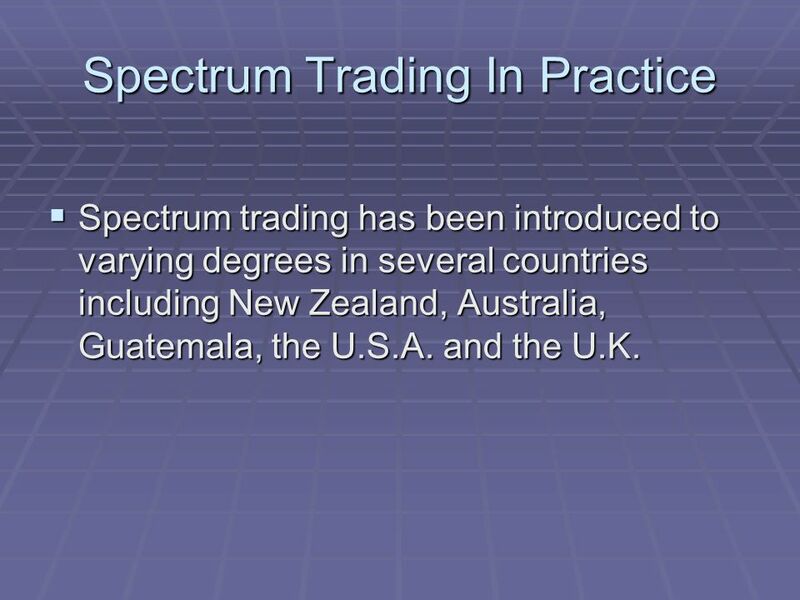 27 Spectrum Trading In Practice  Spectrum trading has been introduced to varying degrees in several countries including New Zealand, Australia, Guatemala, the U.S.A. and the U.K.
29 Spectrum Trading In Practice  Australia –  Australia chose to divide spectrum into blocks of frequency and area called STUs  STUs can be combined vertically (increased bandwidth) or horizontally (increased coverage)  The country was divided by a spectrum map grid, where the cell size varied depending on location and population level with larger cells in rural areas. 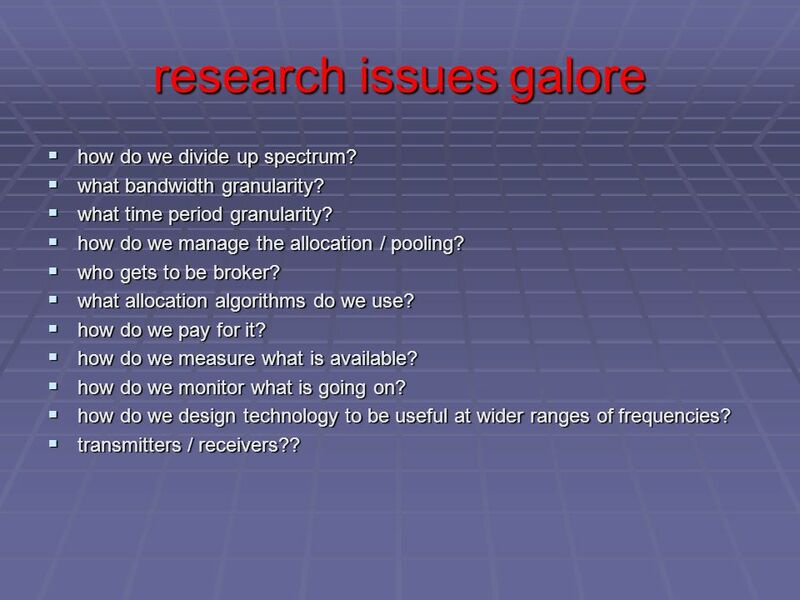 32 research issues galore  how do we divide up spectrum?  what bandwidth granularity?  what time period granularity? 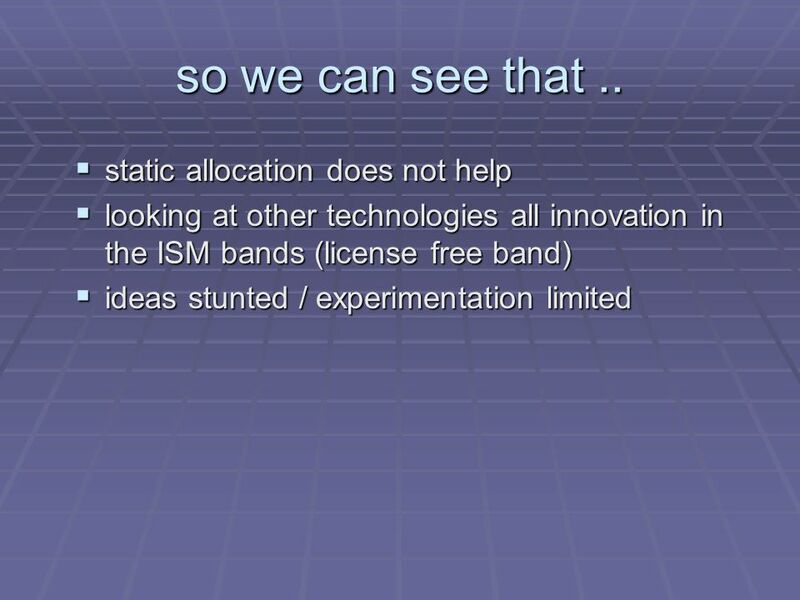  how do we manage the allocation / pooling?  who gets to be broker?  what allocation algorithms do we use?  how do we pay for it?  how do we measure what is available?  how do we monitor what is going on? 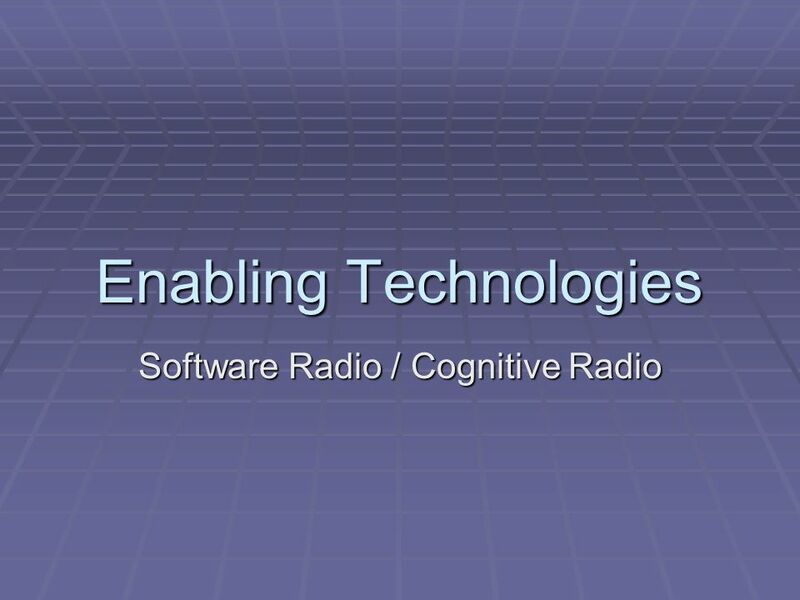  how do we design technology to be useful at wider ranges of frequencies?  transmitters / receivers?? 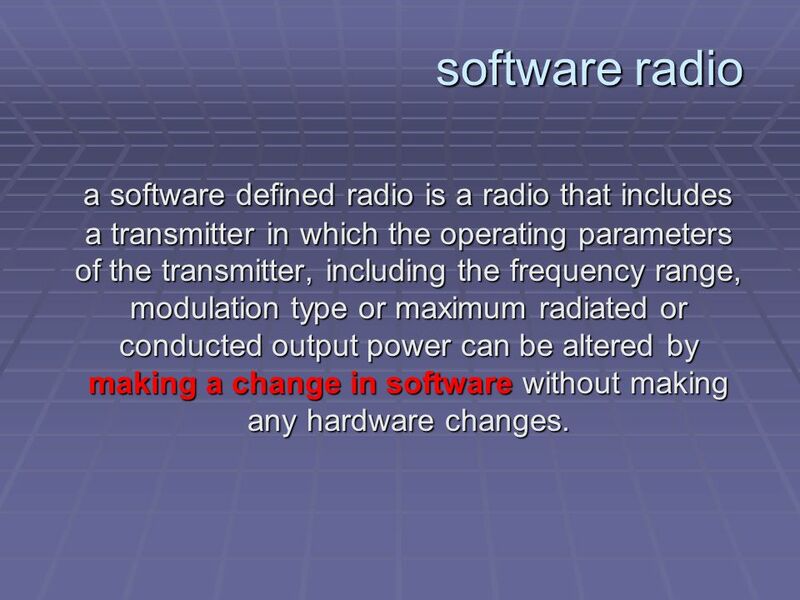 34 software radio a software defined radio is a radio that includes a transmitter in which the operating parameters of the transmitter, including the frequency range, modulation type or maximum radiated or conducted output power can be altered by making a change in software without making any hardware changes. 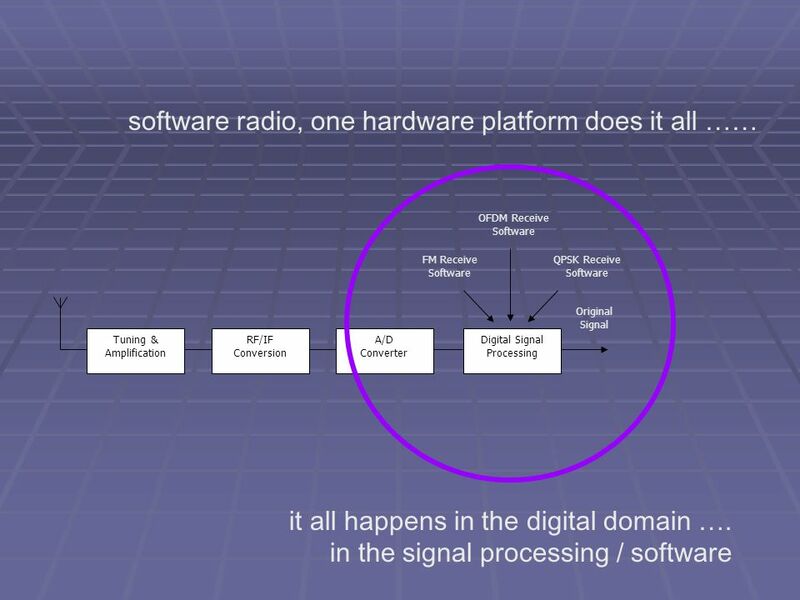 a software defined radio is a radio that includes a transmitter in which the operating parameters of the transmitter, including the frequency range, modulation type or maximum radiated or conducted output power can be altered by making a change in software without making any hardware changes. 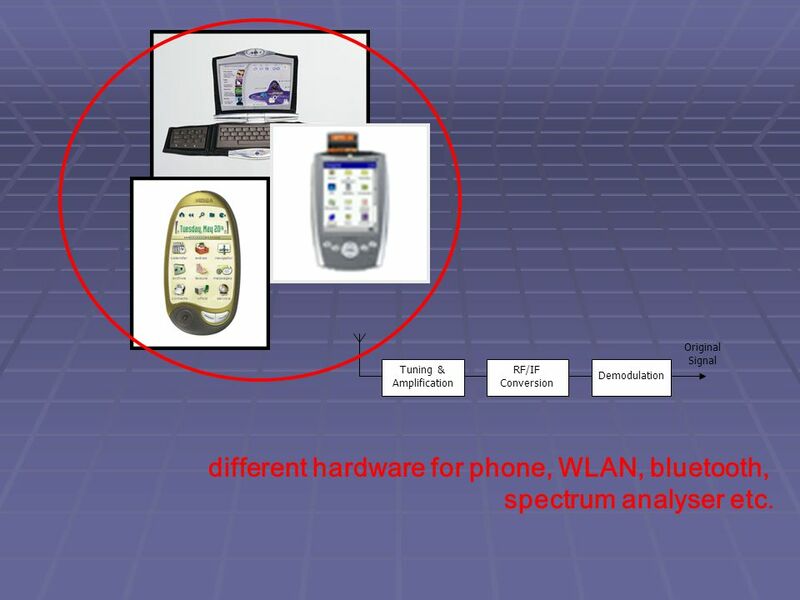 35 Original Signal Tuning & Amplification RF/IF Conversion Demodulation different hardware for phone, WLAN, bluetooth, spectrum analyser etc. 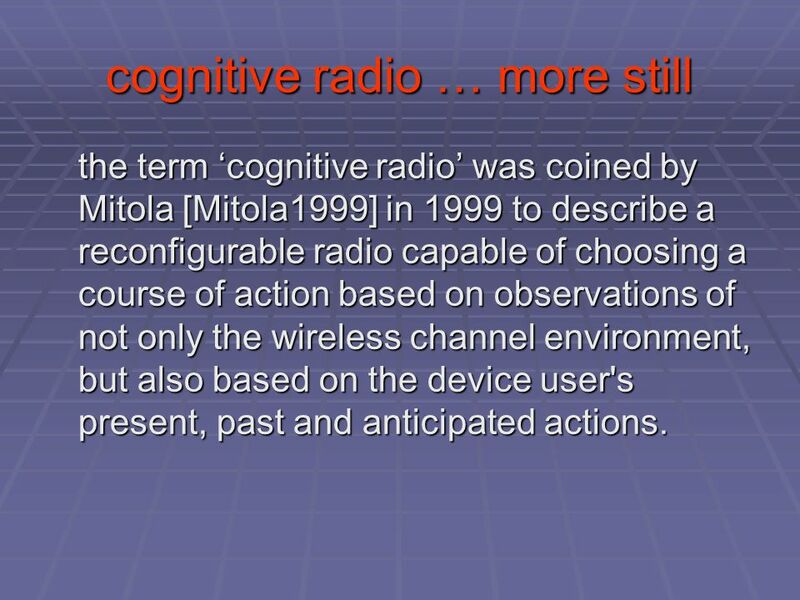 37 cognitive radio … more still the term ‘cognitive radio’ was coined by Mitola [Mitola1999] in 1999 to describe a reconfigurable radio capable of choosing a course of action based on observations of not only the wireless channel environment, but also based on the device user's present, past and anticipated actions. 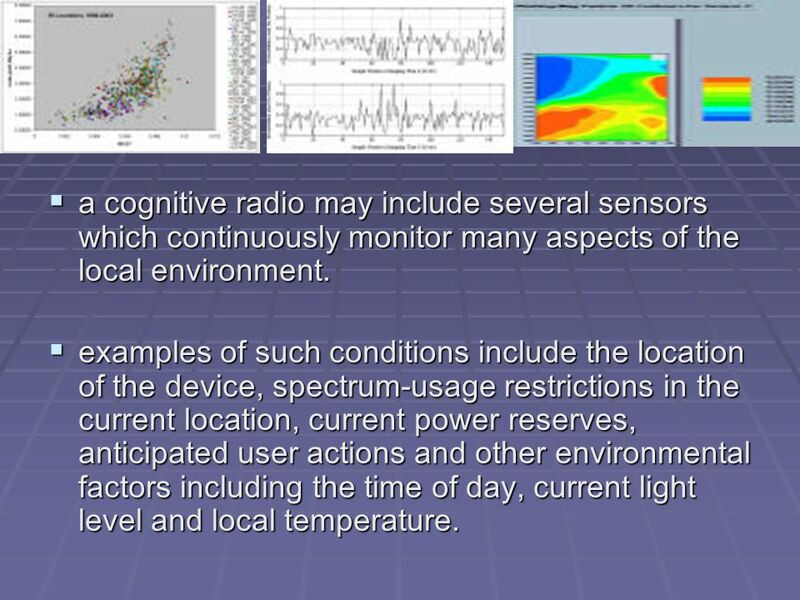 38  a cognitive radio may include several sensors which continuously monitor many aspects of the local environment.  examples of such conditions include the location of the device, spectrum-usage restrictions in the current location, current power reserves, anticipated user actions and other environmental factors including the time of day, current light level and local temperature. 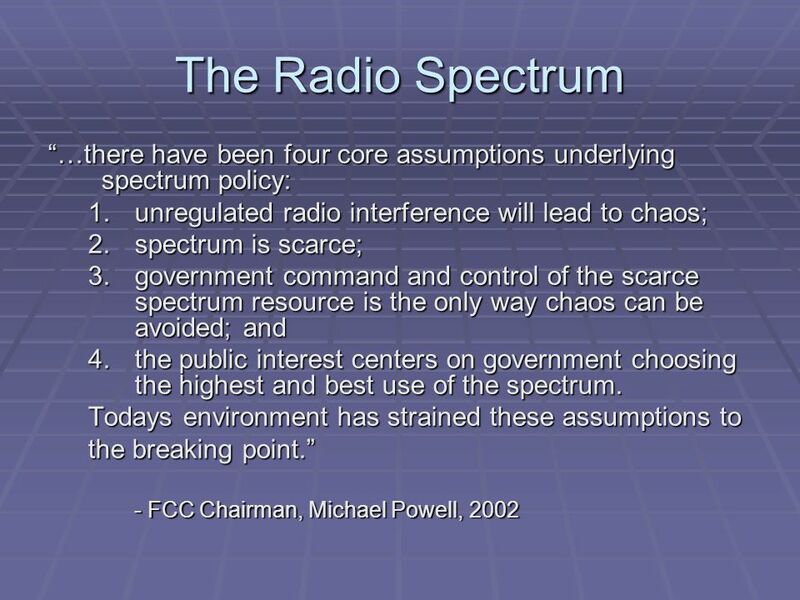 39  the concept of this cognitive radio system also includes the ability to conform to spectrum etiquette. 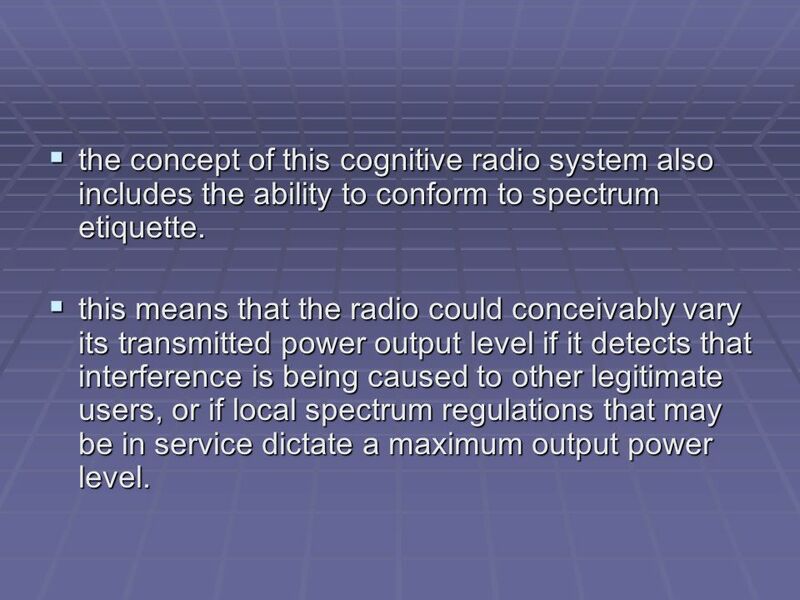  this means that the radio could conceivably vary its transmitted power output level if it detects that interference is being caused to other legitimate users, or if local spectrum regulations that may be in service dictate a maximum output power level. 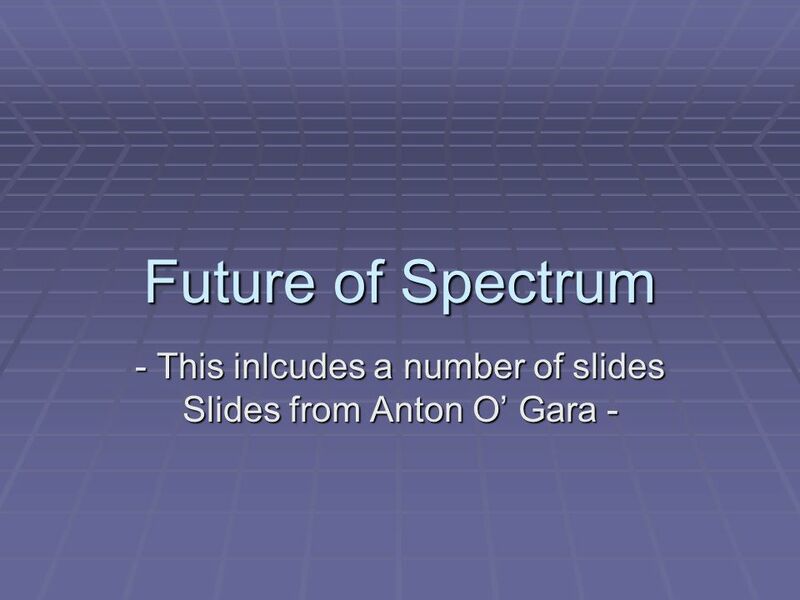 Download ppt "Future of Spectrum - This inlcudes a number of slides Slides from Anton O’ Gara -"
Doc. : IEEE /0046r0 Submission July 2009 Ari Ahtiainen, NokiaSlide 1 A Cooperation Mechanism for Coexistence between Secondary User Networks on. 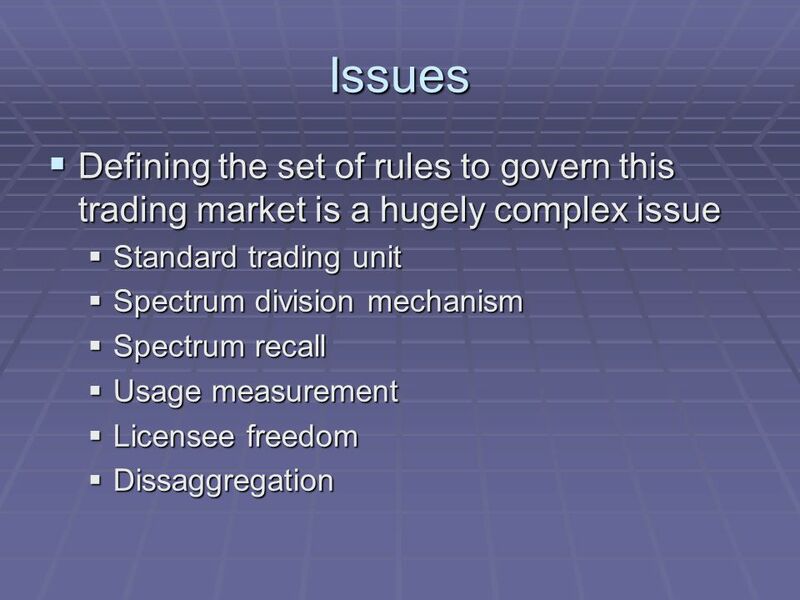 The Implications of Convergence on Spectrum Management Mike Goddard Director, Spectrum and International Policy Radiocommunications Agency, UK. Policy and Regulatory Challenges – Technology Providers View February 14 Challenges for Successful Implementation of ICT Projects Challenges for Successful. 1 Switchover from Analogue to Digital Terrestrial Television Broadcasting in Central and Eastern Europe Case Study of Poland Péter Vári Belgrade, 28th. Long Term Evolution LTE Long Term Evolution LTE Sanjeev Banzal Telecom Regulatory Authority of India Sanjeev Banzal Telecom Regulatory. High Speed Networks Budapest University of Technology and Economics High Speed Networks Laboratory General Distributed. Chapter 5 Voice Communication Concepts and Technology. Implementing Geolocation: enabling white space devices in the UK Prof. H Nwana 5 October 2011 TV White Spaces Spectrum in Africa Workshop. 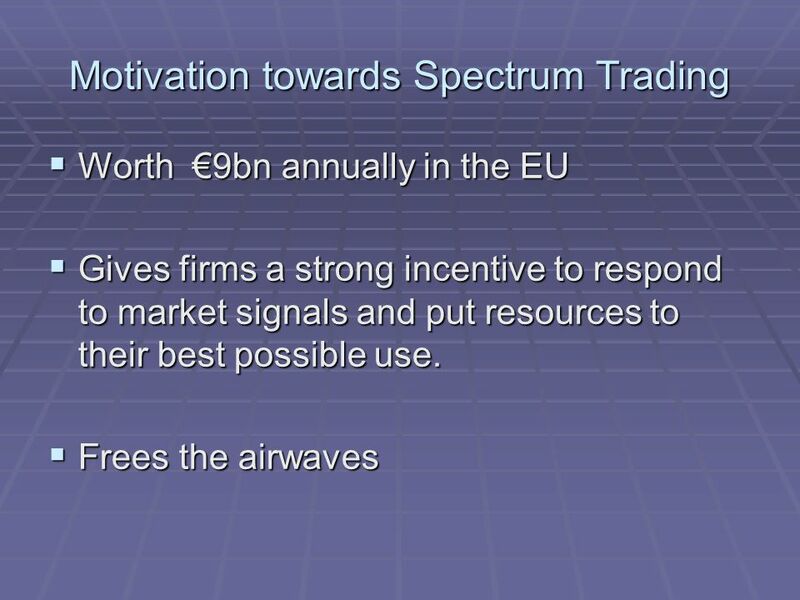 IE 419/519 Wireless Networks Lecture Notes #6 Spread Spectrum. Innovation in Impact Investing: The Use of Impact Shares in the Energy Industry Team B2. FOURTH SADC DIGITAL BROADCASTING MIGRATION FORUM, AUGUST 2012 MANAGING DTT HARMFUL INTERFERENCE ENGR. EDWARD I. AMANA. A Critique of Open Spectrum from Within Robert Horvitz Director OPEN SPECTRUM FOUNDATION Amsterdam/Prague _______________ Wizards of OS 4.0 Berlin, Germany. April 25, 2005ECE 457 Cellular Communication ECE 457 Spring 2005. Geolocation databases for spectrum sharing : ECC findings and studies EC DG CONNECT Workshop, 20 March 2015 Bruno Espinosa, Deputy Director, ECO. 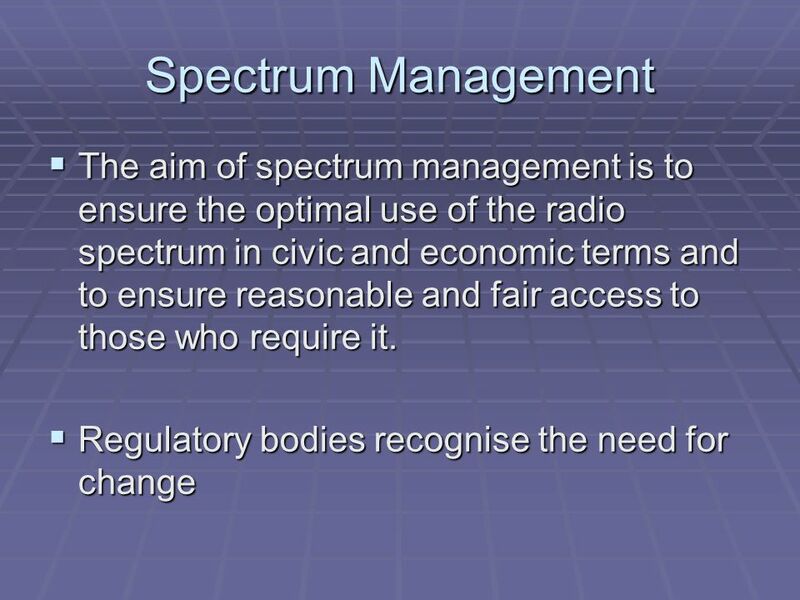 UK Spectrum Management Strategy: tomorrow’s challenges today Chris Woolford Director, International Spectrum Policy Radcomms 2014. 1 2 nd INDUSTRY CONSULATION ON PROPOSED UNIFIED LICENSING FRAMEWORK IN KENYA: KCCT 19 th March 2008 Frequency Issues Communications Commission of Kenya.